While I haven't noticed that the UK seems to have quite as voracious of an appetite for the hospital drama as the United States does-- the one thing the land that brought us both Agatha Christie and Sherlock Holmes can't seem to get enough of is detective shows. Whether they're in the vein of the tough and gritty police procedural dramas like Prime Suspect, Blue Murder or Taggart, or they opt for more of a psychological or sociological spin on the subject matter a la The Ruth Rendell Mysteries or Cracker, take the cases to the country in the ever-popular Midsomer Murders or give us a comedic twist to policing via The Last Detective-- Granada, ITV, and the BBC never tire of the crime and punishment genre and screenwriters know it. However, as TV scribes Matthew Graham, Tony Jordan, and Ashley Pharoah phrased it-- in a series of extensive and fascinating episodic behind-the-scenes featurettes about their international award-winning success Life On Mars that's weaved throughout the slim-packaged four-disc set-- even though networks always want cop shows, they hate writing them. And honestly when you see something as brilliantly creative as the series they ended up crafting, you'll immediately understand why a simple by-the-numbers, predictable police-procedural drama (that frankly as both a writer and reviewer I'm starting to grow weary of myself) would've been a massive waste of their extraordinary talents. Asked to pitch a handful of series-- the writers put everything they had into a concept back in 1998 of a show they'd titled at the time simply "Ford Granada" after the classic '70s car. 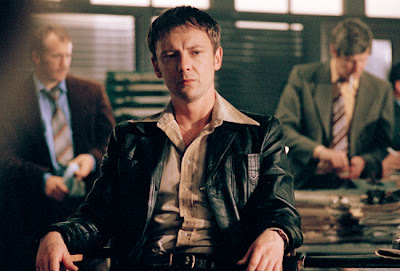 To this end, they painted the idea of the show in with broad strokes and likened it to the era's police shows they enjoyed growing up such as The Sweeney with the twist being that a modern day police officer had somehow traveled back in time in a way that emphasized solely the science fiction/fantasy element of the piece rather than the complex psychological puzzle it would become. So it bounced from network to network in an odyssey as that sort of back of the drawer gem of a script that never went out of date since as the writers state-- good ideas keep. And sure enough, Mars proved that not only did the script not have an expiration date, it would only improve with time and development as eventually it once again landed back in presentation at the BBC at precisely the right moment in time before the right two women who had just relaunched Doctor Who to a phenomenally successful run. 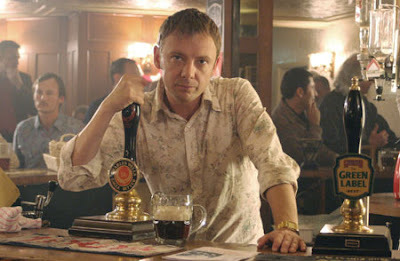 Although the screenwriters were initially worried that the channel would be concerned that two series airing simultaneously that dealt with science fiction/fantasy and time travel would be too risky, the show immediately found champions at BBC who saw its big screen potential, the epic level of storytelling involved and commissioned a full season's worth of scripts to begin production very quickly. Instead of falling into the trap of camp, the writers, producers and the talented director Bharat Nalluri opted to go for a less obvious color palette and more accurate depiction for the series by modeling it after '70s films such as All the President's Men and Get Carter with the latter being especially ironic as the Mars cinematographer was the grandson of the director of photography on the original version of Carter. Cleverly, the show tries to trick you into assuming it's a straightforward action piece with one hell of a kick. This of course comes in the noteworthy and much-cited hook given the writers' ingenious decision to blend police procedural works with time travel fantasy. 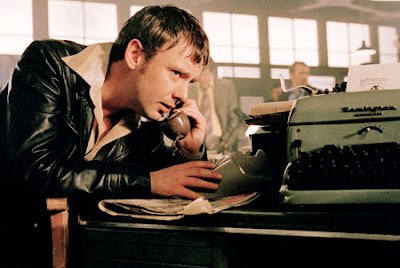 In Mars-- organized, overly analytical, and coolly methodical "by the book" DCI Sam Tyler (State of Play's brilliant John Simm) finds himself shockingly transported from 2006 Manchester to 1973 after being hit by a speeding car while in pursuit of a killer who had captured his colleague and girlfriend Maya. Taking its title from the David Bowie song by the same name which had been playing on Sam's iPod when he'd been struck--the song continues seamlessly but switches format into 1973' eight track tape playing in a car that Sam finds himself in during the time shift. Obviously, he's shocked to discover not just what's happened but also that he's been demoted to the rank of simply detective inspector when he finds that he has identification in his wallet. He learns this after another officer tells him that he's there as part of a transfer he'd requested from C Division of the Hyde Police Department (which Wikipedia notes could be a nod to Jekyll and Hyde). Furthermore Sam is startled when he walks into the homicide division of the local department to uncover just how different the job was thirty three years earlier. Long before the notion of political correctness had set in and when in fact the female officers were kept mostly separate from the males-- Sam has a hard time fitting in with the hard drinking, smoking, boisterous lot where he outranks most of the others and continually butts heads with his superior officer-- who in '06 would've been his equal. 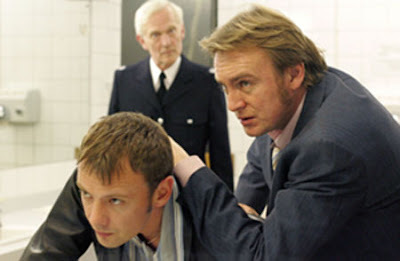 As DCI Gene Hunt, Philip Glenister is the perfect foil for the neat, quiet and proper detective. Hunt wants to do what he thinks is right no matter what is takes. And to achieve his goal, Gene Hunt isn't above beating a confession out of a suspect whether he's guilty or not, smacking around coppers including greeting Sam with a pretty intense physical threat, planting evidence, and above all going with his gut instead of the facts to try and close a case. While Sam wants to do everything by the book, in Gene's eyes-- the only the goal that matters is to keep the bad guys off the streets and away from the citizens much like the cowboys in the American western films he cherishes. When we first meet Gene, the poster hanging in his office is High Noon-- the classic film about a solitary man who asked for help but had to go it alone to go where nobody else would to take out the villains but as Mars progresses, the poster slowly changes to The Good, the Bad, and the Ugly as Gene and Sam begin to bond a bit realizing that possibly together by compromising a bit of the head and the heart, they may make an ideal police detective. 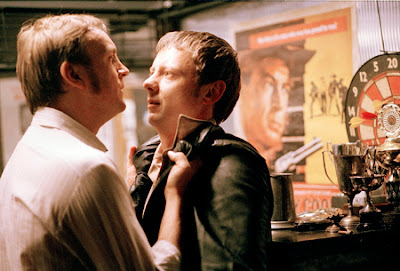 However, along the way, Sam tries everything he can to get back home to '06 and when initially the case he's first presented with has much in common with the one that brought him to 1973, he assumes that all he'll need to do is solve it to "free" himself of this temporary imprisonment he's certain is simply a coma. Adding to his belief-- throughout the eight episodes that make up the first season, we hear the sounds of medical beeps, people talking about tests, catheters, machines, and bodily responses so often that it does make us feel like he could be right in assuming that none of this is real. Yet, there's a flip-side to the issue as well and that one is that Sam may in fact be mad as the hatter in the Alice in Wonderland like fantasies he sort of half-hallucinates in the series which you'll start to see a few episodes into season one. And this theory can be equally argued since literary references to not just Wonderland but Jekyll, Wizard of Oz, Dickens, and other works abound as well as our questions about just what the reality is regarding Sam and his family since he tracks down his mom midway through the season in a plot device that comes back to a haunting effect. However, in arguing that since the world he's residing in contains so much detail and is filled with buildings, cars, and people-- not to mention wall to wall music that's so impressive you'll want to watch it in the 5.1 surround sound-- Sam's loyal friend throughout the series, the lovely Annie Cartright (Liz White) tries to assure him that he has to in fact be living in 1973. She further rationalizes that he has to be simply suffering from a brain injury sustained that year when we first saw him playing "Life On Mars" on the eight track tape having arrived for his transfer. Holding a college degree in psychology and not quite fitting in at the police department in a pre-feminist era-- Annie serves as Sam's love interest, friend, shoulder to lean on, and endless source of both professional and personal backup throughout the show and White is the series' personification of sunshine, bringing an instant smile to both Sam and the viewers' face every time she appears onscreen with her sweetness and constant willingness to help. Not since Mad Men has a modern show managed to grab me without letting go and all of the elements worked together as if I were listening to a complicated concerto. Moreover some of the episodes-- much like those of Mad Men-- continue to linger as I write this and will remain for quite some time as they made not just the writer in me marvel at the creativity of the craftsmanship but I also became incredibly moved once again by the way that Simm can manage to bring tears to your eyes by seemingly conveying thought on camera. Furthermore, I can't say enough about the show's unique style in presenting the '70s in a way that was far more cinematic than any small screen approach on record that I can recall. 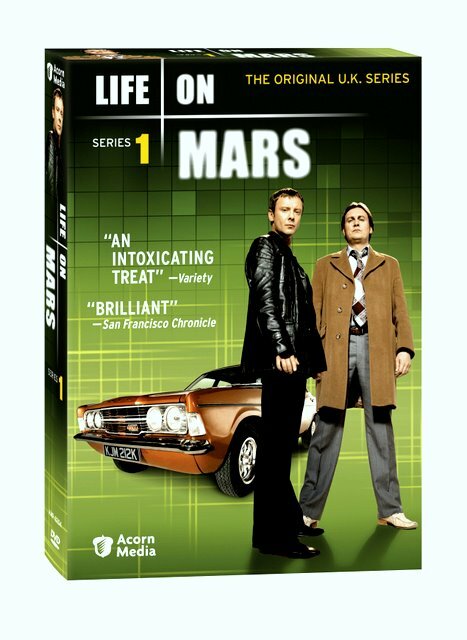 Boasting commentary on all eight episodes and a plethora of extra features-- some of which I had to stop watching since they gave away spoilers for the series-- the quality of the set is impeccable and Life On Mars is definitely on my list of the must own DVD releases of 2009. Although it is unfortunate that it took nearly ten years for the writers' vision to find its way to production-- I'm thrilled that it wasn't simply a time travel series as ambiguity is what made show not only gripping but also psychologically haunting, visceral and immediately breathtaking since it's a damn near intoxicating and purely cinematic experience that must be shared with others. Likewise, you'll find yourselves wanting to discuss it endlessly after certain episodes-- feeling both torn between the urgency of wanting to move onto the next installment and the need to dissect and appreciate the levels of what you've just seen on another level. It's a rare treat for television to have that much of an impact on us and a sad state of affairs when scripted shows are being dumped in favor of more and more reality efforts but thanks to the BBC, the other UK networks and our friends at Acorn, at least we know that we'll always be able to find something to watch down the road even if we face another lineup of standard cops and docs shows hitting the airwaves this fall.